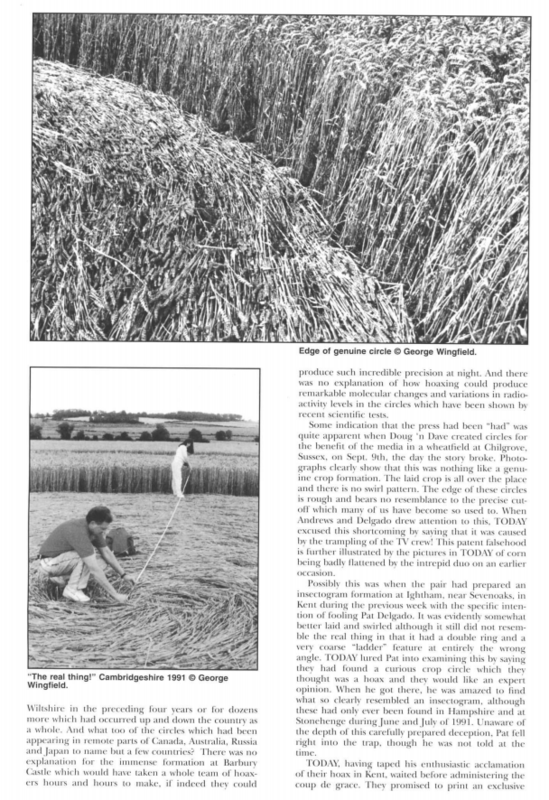 In September 1991 just as the harvest was virtually complete and there were no more circles left if the wheatfields, a strangely discordant note was struck with the publication of a story in TODAY newspaper. 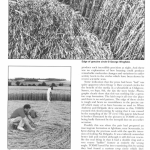 Two Southampton sexagenarians, Doug Bower and Dave Chorley, made the claim that they had hoaxed the majority of the Hampshire crop circles over a period of 13 years. 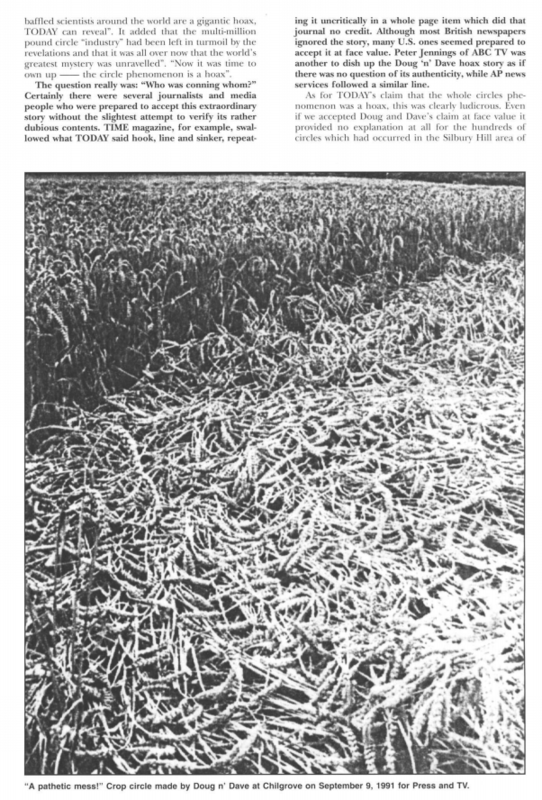 They had ‘created no less than 200 corn circles — the very ones that renowned expert and author Patrick Delgado has judged “genuine” or not man-made’. Starting near Cheesefoot Head in 1978, they went out night after night to make circles using a 4ft. wooden plank, a ball of string and baseball cap with a wire threaded through the visor as a sighting device. 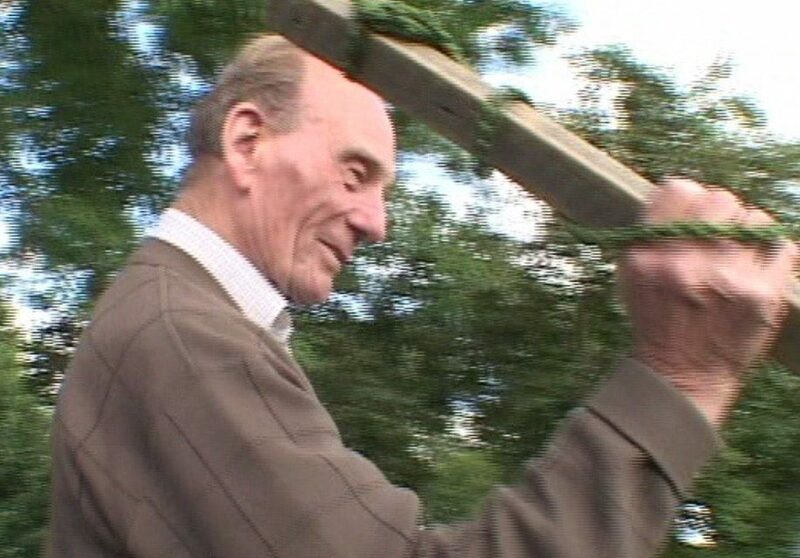 Sworn to secrecy, Doug and Dave claimed to have made 25 to 30 new circles each season in the Cheesefoot Head, Warminster and Westbury areas and, more recently, Stonehenge. ‘But after 6 years of Doug’s nightly disappearances Doug’s wife, Ilene, had grown suspicious.’ ‘It started to cross my mind that he might be seeing another woman,’ she said. Photographs of the two men pushing corn down with planks held by a length of rope accompanied the text of what seemed a most unconvincing story. Apart from all the circles at Cheesefoot Head in earlier years, they laid claim to all the 1990 Hampshire pictograms, the 1991 insectograms and ‘curligram’ designs and the three six-petalled flower formations — something which would have entailed dedicated and arduous labour night after night. Yet, apart from one formation which they made in Kent and another in Sussex, they offered no proof whatsoever that they had made any crop formations at at all. ‘MEN WHO CONNED THE WORLD’ shouted TODAY’s headlines. 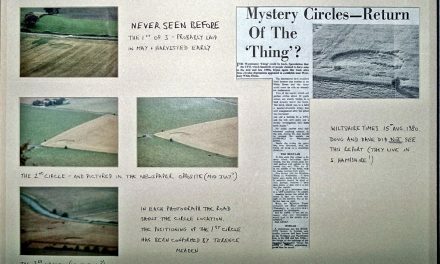 ‘The mysterious corn circles that baffled scientists around the world are a gigantic hoax, TODAY can reveal.’ It added that the multi-million pound circle ‘industry’ had been left in turmoil by the revelations and that it was all over now that the world’s greatest mystery was unravelled. ‘Now it was time to own up — the circle phenomenon is a hoax’. The question really was: ‘Who was conning whom?’ Certainly there were several journalists and media people who were prepared to accept this extraordinary story without the slightest attempt to verify its rather dubious contents. TIME magazine, for example, swallowed what TODAY said hook, line and sinker, repeating it uncritically in a whole page item which did that journal no credit. Although most British newspapers ignored the story, many U.S. ones seemed prepared to accept it at face value. 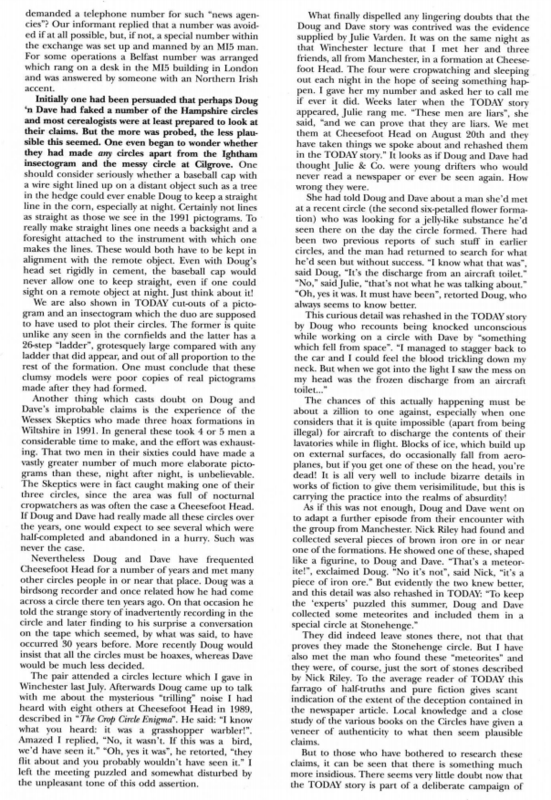 Peter Jennings of ABC TV was another to dish up the Doug ‘n’ Dave hoax story as if there was no question of its authenticity, while AP news services followed a similar line. As for TODAY’s claim that the whole circles phenomenon was a hoax, this was clearly ludicrous. 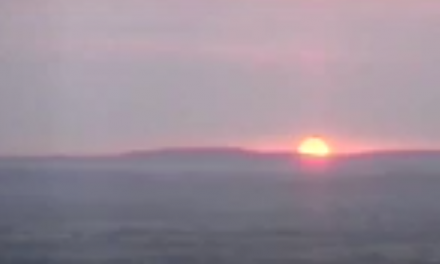 Even if we accepted Doug and Dave’s claim at face value it provided no explanation at all of the hundreds of circles which had occurred in the Silbury Hill area of Wiltshire in the preceding four years or for dozens more which had occurred up and down the country as a whole. And what too of the circles which had been appearing in remote areas of Canada, Australia, Russia and Japan to name but a few countries? There was no explanation for the immense formation at Barbury Castle which would have taken a whole team of hoaxers hours and hours to make, if indeed they could produce such incredible precision at night. And there was no explanation of how hoaxing could produce such remarkable molecular changes and variations in radioactivity levels in the circles which have been shown by recent scientific tests. Some indication that the press had been ‘had’ was quite apparent when Doug ‘n’ Dave created circles for the benefit of the media in a wheatfield at Chilgrove, Sussex, on Sept. 9th, the day before the story broke. 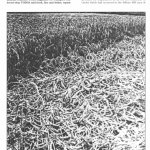 Photographs clearly show that this was nothing like a genuine crop formation. The laid crop is all over the place and there is no swirl pattern. The edge of these circles is rough and bears no resemblance to the precise cut-off which many of us have become so used to. When Andrews and Delgado drew attention to this, TODAY excused the shortcoming by saying that it was caused by the trampling of the TV crew! This patent falsehood is further illustrated by the pictures in TODAY of corn being badly flattened by the intrepid duo on an earlier occasion. Possibly this was when the pair had prepared an insectogram formation at Ightham, near Sevenoaks, in Kent during the previous week with the specific intention of fooling Pat Delgado. It was evidently somewhat better laid and swirled although it still did not resemble the real thing in that it had a double ring and a very coarse ‘ladder’ feature at entirely the wrong angle. TODAY lured Pat into examining this by saying they had found a curious crop circle which they thought was a hoax and they would like an expert opinion. When he got there, he was amazed to find what so clearly resembled an insectogram, although these had only ever been found in Hampshire and at Stonehenge during June and July of 1991. Unaware of the depth of this carefully prepared deception, Pat fell right into the trap, though he was not told at the time. TODAY, having taped his enthusiastic acclamation of their hoax in Kent, waited before administering the coup de grace. They promised to print an exclusive scoop, on condition that he told no one of this ‘find’. Two days later Pat Delgado and Colin Andrews drove down to Glastonbury to speak at the ‘Cornference’, the first annual meeting of the Cereologist magazine. Not a word of all this was mentioned to Colin on the journey, but it did seem that Pat was ill at ease about something. On the following day TODAY brought Doug and Dave to Pat’s house. In quickfire succession they confronted him with proof that they had made the Kent formation, then laid claim to this circle and that circle and so on until he was literally reeling on the ropes. 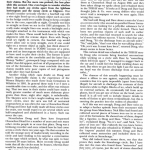 The TODAY reporter, Graham Brough, then wrung all sorts of unwise concessions from his hapless victim which were subsequently printed in the paper. At some stage Pat’s daughter Jan called Colin Andrews telling him to come at once since Pat ‘had collapsed’. Colin, unable to understand what had happened and fearing the worse, leapt into his car to drive to Arlesford and was almost immediately stopped by police for speeding in a built-up area. When he eventually got there he was able to question the two tormentors, and soon realised that many of their claims were false. At this stage TODAY withdrew the two, but it had more than enough on tape to bolster their specious tale. They might be unable to make convincing crop circles, but at least they had scored a famous victory in psychological warfare. At this stage it is useful to enquire where this campaign — for it was clearly much more than just a story in a newspaper — might be coming from. 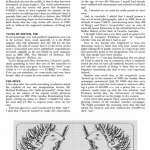 Nearly one year earlier CCCS had received information concerning a Government meeting on the crop circles. This was held in London in September 1990 and involved three Ministries: Defence, Agriculture and Environment. The meeting was at ministerial — rather than at cabinet — level, and Margaret Thatcher, then Prime Minister, did not attend. It was held against a background of mounting public fascination with the phenomenon, and people had been driving all over Britain to see the circles which were then appearing in increasing numbers and with growing articulateness. The meeting lasted long and the conclusion was that the cause of the crop circles was completely unknown. Stationary whirlwinds were ruled out and it was stated that hoaxing only accounted for an insignificant percentage of the circles. Responsibility for keeping track of what was happening was left firmly with the Ministry of Defence who had for some years used Army helicopters to photograph new circles. The MoD would also, if need arose, ‘take appropriate measures’. And it was at this meeting that ‘disinformation’ was discussed as a possible measure. These details were supplied by someone who was present at the meeting and, although it has never been made public, the foregoing is quite definitely fact and not fiction. Could there then be any connection between this proposed disinformation and this story in TODAY newspaper? One intriguing detail in the first day’s instalment was the final brief sentence. This read ‘TODAY has paid no money’, and was followed by the words ‘Copyright MBF Services’. Who, then, were MBF Services? 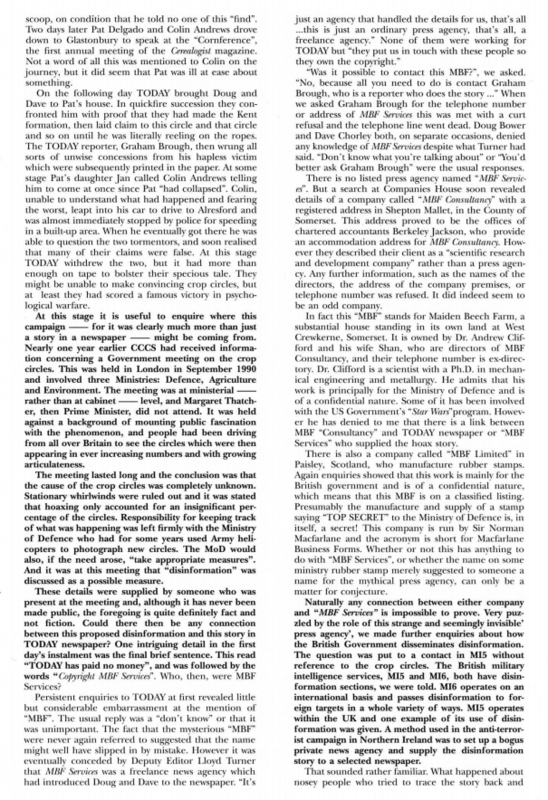 ‘Was it possible to contact this MBF?’, we asked, ‘No, because all you need to do is contact Graham Brough, who is a reporter, who does the story …’ When we asked Graham Brough for the telephone number or address of MBF Services this was met with a curt refusal and the telephone line went dead. Doug Bower and Dave Chorley both, on separate occasions, denied any knowledge of MBF Services despite what Turner had said. ‘Don’r know what you’re talking about’ or ‘You’d better ask Graham Brough’ were the usual responses. There is no listed press agency named ‘MBF Services‘. But a search at Companies House soon revealed details of a company called ‘MBF Consultancy‘ with a registered address at Shepton Mallet, in the County of Somerset. This address proved to be the offices of chartered accountants Berkeley Jackson, who provide an accommodation address for MBF Consultancy. However they described their client as a ‘scientific research and development company’ rather than a press agency. Any further information, such as the names of the directors, the address of the company premises, or telephone number was refused. It did indeed seem to be an odd company. In fact this ‘MBF’ stands for Maiden Beech Farm, a substantial house standing in its own land at West Crewkerne, Somerset. It is owned by Dr. Andrew Clifford and his wife Shan, who are directors of MBF Consultancy, and their telephone number is ex-directory. Dr. Clifford is a scientist with a Ph.D. in mechanical engineering and metallurgy. He admits that his work is principally for the Ministry of Defence and is of a confidential nature. Some of it has been involved with the US Government’s ‘Star Wars‘ program. However he has denied to me that there is a link between MBF ‘Consultancy’ and TODAY newspaper or ‘MBF Services’ who supplied the hoax story. There is also a company called ‘MBF Limited’ in Paisley, Scotland, who manufacture rubber stamps. Again enquiries showed that this work is mainly for the British government and is of a confidential nature, which means that this MBF is on a classified listing. Presumably the manufacture and supply of a stamp saying ‘TOP SECRET’ to the Ministry of Defence is, in itself, a secret! This company is run by Sir Norman Macfarlane and the acronym is short for Macfarlane Business Forms. Whether or not this has anything to do with ‘MBF Services’, or whether the name on some ministry rubber stamp merely suggested to someone a name for the mythical press agency, can only be a matter for conjecture. Naturally any connection between either company and ‘MBF Services‘ is impossible to prove. Very puzzled by the role of this strange and and seemingly invisible ‘press agency’, we made further enquiries about how the British Government disseminates disinformation. The question was put to a contact in MI5 without reference to the crop circles. The British military intelligence services, MI5 and MI6, both have disinformation sections, we were told. MI6 operates on an international basis and passes disinformation to foreign targets in a whole variety of ways. 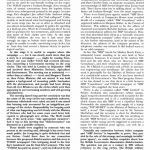 MI5 operates within the UK and one example of its use of disinformation was given. A method used in the anti-terrorist campaign in Northern Ireland was to set up a bogus private news agency and supply the disinformation story to a selected newspaper. That sounded rather familiar. What happened about nosey people who tried to trace the story back or demanded a telephone number for such ‘news agencies’? Our informant replied that a number was avoided if at all possible, but, if not, a special number within the exchange was set up and manned by an MI5 man. For some operations a Belfast number was arranged which rang on a desk in the MI5 building in London and was answered by someone with an Northern Irish accent. Initially one had been persuaded that perhaps Doug ‘n’ Dave had faked a number of Hampshire circles and most cerealogists were at least prepared to look at their claims. But the more was probed, the lass plausible this seemed. One even began to wonder whether they had made any circles apart from the Ightham insectogram and the messy circle at Cilgrove. One should consider seriously whether a baseball cap with a wire sight lined up on a distant object such as a tree in the hedge could ever enable Doug to keep a straight line in the corn, especially at night. Certainly not lines as straight as those we see in the 1991 pictograms. To really make straight lines one needs a backsight and a foresight attached to the instrument with which one makes the lines. These would both have to be kept in alignment with the remote object. Even with Doug’s head set rigidly in cement, the baseball cap would never allow one to keep straight, even if one could sight on a remote object at night. Just think about it! We are also shown in TODAY cut-outs of a pictogram and insectogram which the duo are supposed to have used to plot their circles. The former is quite unlike any seen in the cornfields and the latter has a 26-step ‘ladder’, grotesquely large compared with any ladder that did appear, and out of all proportion to the rest of the formation. One must conclude that these clumsy models were poor copies of real pictograms made after they had formed. 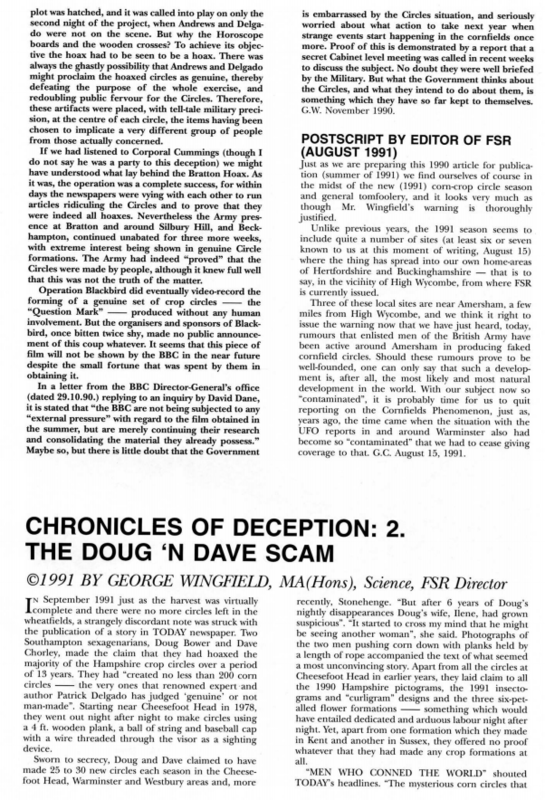 Another thing which casts doubt on Doug and Dave’s impossible claims is the experience of the Wessex Skeptics who made three hoax formations in Wiltshire in 1991. In general these took 4 or 5 men a considerable time to make, and the effort was exhausting. That two men in their sixties could have made a vastly greater number of more elaborate pictograms than these, night after night, is unbelievable. The Skeptics were in fact caught making one of their three circles, since the area was full of nocturnal cropwatchers as was often the case at Cheesefoot Head. If Doug and Dave really had made all these circles over the years, one would expect to see several which were half-completed and abandoned in a hurry. Such was never the case. Nevertheless Doug and Dave have frequented Cheesefoot Head for a number of years and met many other people in or near that place. Doug was a birdsong recorder and once related how he had come across a circle there ten years ago. 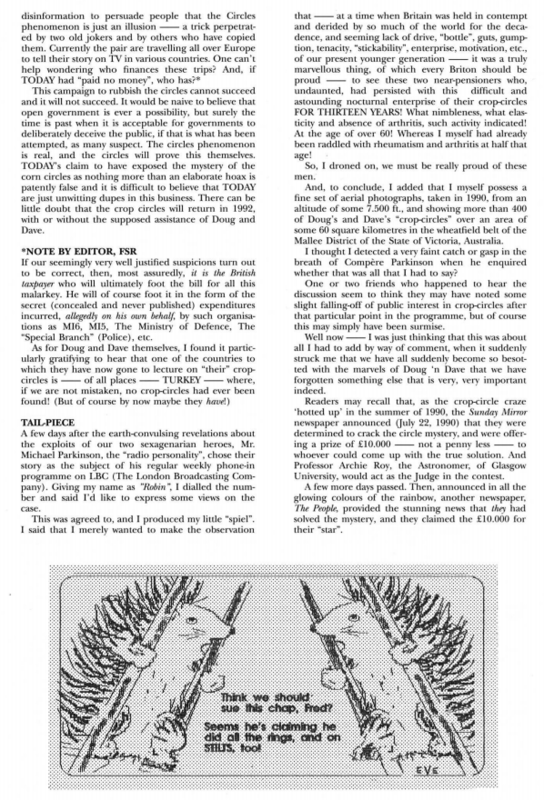 On that occasion he told the strange story of inadvertently recording in the circle and later finding to his surprise a conversation on the tape which seemed, by what was said, to have occurred 30 years before. More recently Doug would insist that all the circles must be hoaxes, whereas Dave would be much less decided. The pair attended a circles lecture which I gave in Winchester last July. Afterwards Doug came up to talk with me about the mysterious ‘trilling’ noise I had heard with eight others at Cheesefoot Head in 1989, decribed in ‘The Crop Circle Enigma‘. He said: ‘I know what you heard: it was a grasshopper warbler!’ Amazed I replied, ‘No, it wasn’t. If this was a bird, we’d have seen it.’ ‘Oh, yes it was,’ he retorted, ‘they flit about and you probably wouldn’t have seen it.’ I left the meeting puzzled and somewhat disturbed by the unpleasant tone of this odd assertion. What finally dispelled any lingering doubts that the Doug and Dave story was contrived was the evidence supplied by Julie Varden. It was on the same night as that Winchester lecture than I met her and three friends, all from Manchester, in a formation at Cheesefoot Head. The four were cropwatching and sleeping out each night in the hope of seeing something happen. I gave her my number and asked her to call me if ever it did. Weeks later when the TODAY story appeared, Julie rang me. ‘These men are liars’, she said, ‘and we can prove that they are liars. We met them at Cheesefoot Head on August 20th and they have taken things we spoke about and rehashed them in the TODAY story.’ It looks as if Doug and Dave had thought Julie and Co. were young drifters who would never read a newspaper or ever be seen again. How wrong they were. She had told Doug and Dave about a man she’d met at a recent circle (the second six-petalled flower formation) who was looking for a jelly-like substance he’d seen there on the day the circle formed. There been two previous reports of such stuff in earlier circles, and the man had returned to search for what he’d seen but without success. ‘I know what that was’, said Doug. ‘It’s the discharge from an aircraft toilet.’ ‘No,’ said Julie, that’s not what he was talking about.’ ‘Oh, yes it was. It must have been’, retorted Doug, who always seems to know better. The chances of this actually happening must be about a zillion to one against, especially when one considers that it is quite impossible (especially when being illegal) for aircraft to discharge the contents of their lavatories while in flight. Blocks of ice, which build up on external surfaces, do occasionally fall from aeroplanes, but if you get one of these on the head, you’re dead! It is all very well to include bizarre details in works of fiction to give them verisimilitude, but this is carrying the practice into realms of absurdity. They did indeed leave stones there, not that that proves they made the Stonehenge circle. But I have also met the man who found these ‘meteorites’ and they were, of course, just the sort of stones described by Nick Riley. To the average reader of TODAY this farrago of half-truths and pure fiction gives scant indication of the extent of the deception contained in the newspaper article. Local knowledge and a close study of the various books on the Circles have given a veneer of authenticity to what then seem plausible claims. But to those who have bothered to research these claims, it can be seen that there is something much more insidious. There seems very little doubt now that the TODAY story is part of a deliberate campaign of disinformation to persuade people that the Circles phenomenon is just an illusion — a trick perpetuated by two old jokers and by others who have copied them. Currently the pair are travelling all over Europe to tell their story on TV in various countries. One can’t help wondering who finances these trips? And, if TODAY had ‘paid no money’, who has? This campaign to rubbish the circles cannot succeed and it will not succeed. It would be naïve to believe that open government is ever a possibility, but surely the time is past when it is acceptable for governments to deliberately deceive the public, if that is what has been attempted, as many suspect. The circles phenomenon is real, and the circles will prove this themselves. TODAY’s claim to have exposed the mystery of the corn circles as nothing more than an elaborate hoax is patently false and it is difficult to believe that TODAY are just unwitting dupes in this business. There can be little doubt that the crop circles will return in 1992, with or without the supposed assistance of Doug and Dave. PreviousDo Rooks Make Crop Circles? Thank you for posting these historic articles. Heaven knows, today’s generation of circle makers and researchers could certainly do with reading them, if only to demonstrate that their grandstanding and feuds are nothing new. It’s all been done before, and with more flair and originality. Thank you. Indeed it is nothing new. Back then it was more amusing though. Now it is just boring. The Croppie has nothing more to say on the situation regardless of who claims what and where. Hindsight suggests that nobody is really interested beyond a very small clique. Everyone is perhaps too focused upon social media conflicts and we all lose sight of the bigger picture.